★★★★★ This is far the best speaer I have ever owned. JBL got this right. The bass is excellent and youvare able to hear all the highs and lows. The volume is controllable thru your phone or the speaker and it will get better loud. I purchased this speaker for my wife, but I immediately got jealous because of how good it sounded and I had to get my own Charge 3 and I make sure that everyone around me at work hears it. Be careful for knockoffs, they are inferior and look just like the real thing and the sound quality is horrible. I know be cause I bought on for $40; and I mean it look like the real thing. The Charge 3 is a very solid speaker in construction and I believe it's weighted just right, because the speaker does not bounce around the table when I'm jamming at a high volume. I listened to the Charge 3 and compared it to other JBL speakers and other brands, but the Charge 3 was my choice. I have not tested it in the rain or dipped it in water, and I don't believe I will, but you can't go wrong with the JBL Charge 3 in my opinion. I used to be a Disc Jockey and the sound man in a band, and I kind of know about sound quality. The JBL Charge 3 gives you the sound quality you're looking for, it's sturdy and looks good. ★★★★★ Sounds great. Perfect price. I doubt spending triple will really make a huge difference, Super long battery life, used it 8 hrs and only used. 1/4 of the battery, still had 3/4 left. Perfect design, solid blue tooth reaches well over 50’, sturdy, decent bass, couldn’t ask for more in a small unit. ★★★★★ Look.... I prefer to be “the first person” to use items when purchased. I like the word new; mine.... So it goes without saying that when I saw this JBL speaker “factory refurbished” I skimmed right past it on my EBay portal. I knew I had a vacation planned for this last 4th of July week. I knew it would be outside by a lake and I most certanially knew that with three teenagers bilking over who has the Bluetooth connection to the “juke-box” I would be wise to find the best deal. Soooooo, I purchased this JBL speaker on a whim; on an impulse; on a ribbon of desperation because a bbq isn’t complete without the music. I AM SO GLAD I DID. This unit rocks. Think SONOS meets portable unit. Yeah, it’s like that. Full High end for the vocals and instruments, full midrange for the hip-hop. All the bass you need to fill a 20’ x 20’ party area; it’s dope. I don’t write reviews because I feel it may be some schmuck paid to make you think some sellers item “is worth it”. I don’t care if you think I’m blowin smoke; this speaker is so dope I’m hammering on my IPad to let you know about it. You want loud, non-distorted music for all venues; jazz, hip-hop, country and blues? You want a speaker that will last all friggin day as you party and get your freak on? You want a speaker system that is waterproof? You want a speaker you can carry with you when golfing, disc golfing and bike riding? This is it. Enjoy the music now; it’s quite silent when your 6 feet deep. ★★★★★ That is what I feel when Super satisfied with a product. 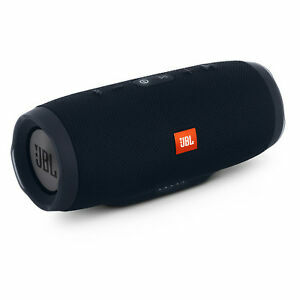 It is not audiophile quality sound but JBL delivers in providing a light and portable player that delivers highly listenable music. On the go. Battery life thus far is excellent and Bluetooth is solid and reliable. One quirk is that it plays loud tones when powering up or connecting to Bluetooth devices that doesn’t appear to be changeable. At the refurb price, what a steal!